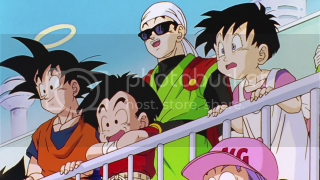 You know, this part of the story always gets a little fuzzy for me as far as details, because I'm busy concentrating on the action, but I think there's something interesting to be said about the lifestyles and economic differences between the Son family and Bulma's. Being extremely wealthy and thus wanting for nothing, Trunks doesn't especially care about getting the prize money. He just wants to prove how strong he is. But the Son family doesn't have a steady cash flow. 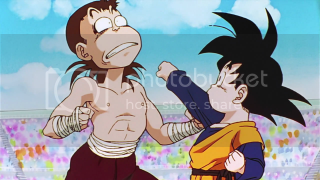 Chi-Chi doesn't work, I think Gyuumao probably squats in caves at this point, and Goku likely blew any of the money he won at the 23rd Budoukai at a Cinnabon at the local mall. Trunks could just let Goten win and get the 10 million zeni prize, providing for his family. But he doesn't. Greedy little douche. But on the plus side, second place wins 5 million zeni, so at least Gohan's textbooks should be paid for. Maybe Goten won't have to eat cat food one night. Trunks is just going to burn his money. Probably buy a gold-plated butler and then get tired of him after a week. They live in the woods, damn it! The Son family lives in the woods and takes baths in barrels heated up with fires. 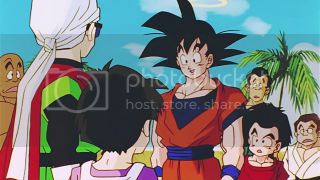 This might suit Goku fine, maybe even Chi-Chi, since they're both kind of hillbillies, but despite the advantages of fresh air, I would think the children would thrive better a little closer to other people. Well, okay, considering their power, maybe it's better they live on a wooded mountain. There's some weird, choppy editing going on in this episode. Surely they could have done a better job than this, right? I mean, just look at the way they edited the part with the Junior Division matches. Especially of note is the part where the one kid is crying and knocks out the other. In the original version, we see the one kid come closer to comfort the crying kid, trying to calm him down, and then get punched out. Here they do such a quick jump between the one kid coming toward the next and then getting punched it's very jarring and out of place. 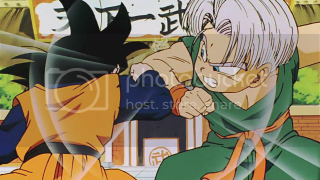 I'm pretty sure they edited out some of the fight between Goten and Trunks, too. Wasn't there a cross-counter punch in there somewhere that got cut? Then we have the continuing blandness of the musical score. For one, the tracks themselves are just so lifeless and generic! My guess is that this is intentional, so they're so interchangeable they can be used in nearly every kind of scene. 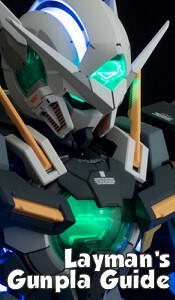 It means that Sumitomo didn't need to put a lot of effort into his compositions and we probably shouldn't expect anything great in the future. 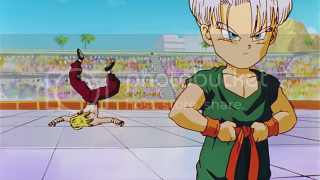 Just take a listen to the music in the match between Goten and Trunks, for instance. It's so lacking in character you could literally use it in any other scene in the episode. I guess Toei believes that this is what international (read: American) audiences want, since this was originally never intended to air on Japanese television. Well, it's not what I want. 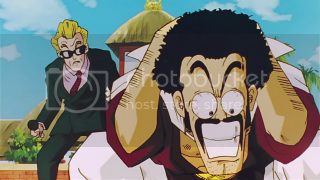 I love the Budoukai, and next episode we get a bt of Mr. Satan wackiness injected in. Don't screw it up, Toei.